We have had no Broadband for a month. Almost. It comes and goes, and we pay Telecom $50 for it to come and go, and our consolation prize has been telephoning 0800 289 987 and talking to Sam, Shane, Janette, Paula and David in Auckland who have variously spent fruitless hours having me check and uncheck various boxes on my antivirus software before finally admitting that the fault is likely to be the Migration which has affected 490 Motueka customers. The Migration is, I gather, an Upgrade. In the meantime we got occasional glimpses of our emails. We do not know what a Migration might be, other than that everything was suddenly to improve a fortnight ago at 6.30 when the Migration was completed and our Broadband restored. The Migration was but the Broadband wasn't. I looked up Migration in the dictionary and it didn't say Munt Your Broadband For Weeks While We Change Cables, but then it is a very old dictionary. In the end they sent us a new modem and now it works. Having no Broadband meant listening to the radio for glimmers of news, and I have learnt all sorts of new words as the journalists keep me abreast of the current crop of neologisms in Corporate Speak. I heard that they have removed the procedure from her heart. A procedure is now a thing rather than an activity, and you can make one in a procedure factory and insert it into peoples' hearts and remove it afterwards. I already knew that Telecom underground their cables but from a report about the airline Quantas I have learnt that you can hub the passengers through Brisbane, which implies that hub has also become a verb. I hub, you hub, he she or it hubs. I underground, you underground, he she or it undergrounds. - At least, I presume he she or it undergrounds, though it could be an irregular verb. We have not been told. We hub, you (pl.) hub, they hub. I have been hubbed through Brisbane. Personally I think verbing our nouns ought to be confined to Shakespeare but after the Arab Spring and the UKUncut demonstrations and the Occupy pepper sprayings I suspect there is a global corporate conspiracy to destroy communication and since undergrounding the cables and migrating the broadband hasn't been wholly successful, they are going to upfuck the language. Anything to stop any more Twitter riots. Cracks are easiliest noticed when the paintwork is white because they show up as black lines. I like white paint. If you were as rubbish a welder as I am you'd like it too. Mr English isn't a rubbish welder but it appears he abruptly ran out of steel tubing, a case, perhaps, of carboning his seat tube. He sent me a pickture and I enquired further. *Very* pretty. - If y'like that sort of thing. - If y'like to have y'neck twisted off and are prepared to substitute a scalpel for a seat. - Okay okay okay. - So what's it weigh? 'Ere, - also, - how d'you specify how to wind carbon? What calculations are involved? I've never done any composite stuff, ever, incl. not-repairing the knackered canoe that still clutters the sheds. And - and and and - is that seat post contiguous with the seat tube? They appear in my spectacles to have the same diameter. And - and and and and *and* - what is the advantage of mixing steel with carbon? Just weight? 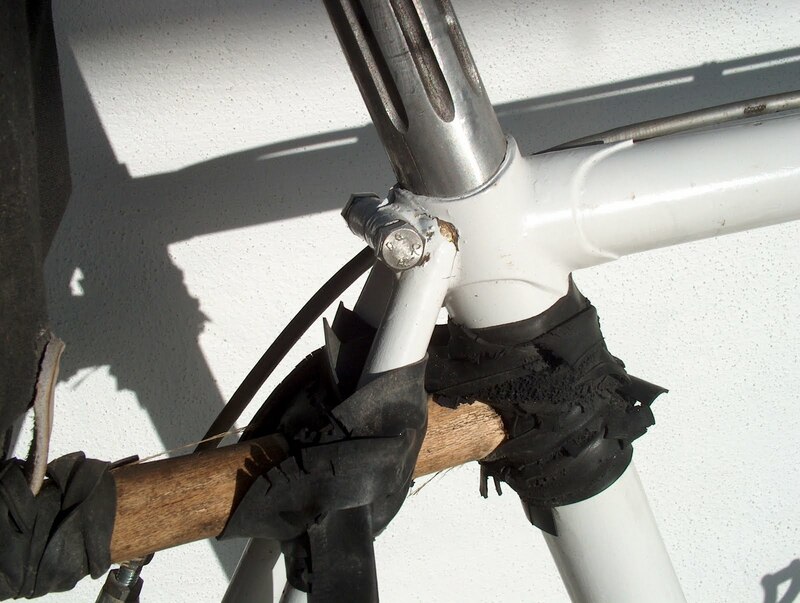 Or is there some fiendishly clever engineering reason for retaining steel in the stays and crossbar and downtube? 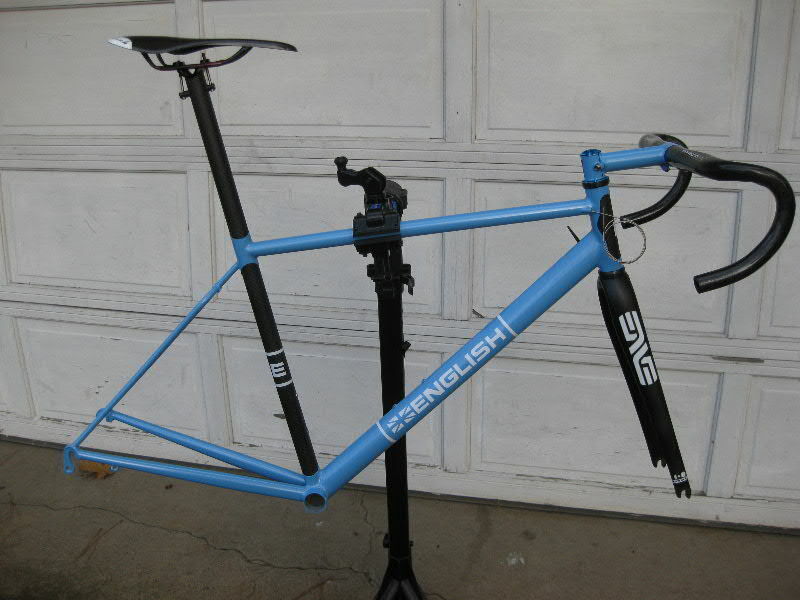 So..... frame is 1200g, projected bike weight is 10.8lbs, hopefully! Specifying the carbon was fairly unsophisticated - I told them what diameter I wanted and what I was using it for, and they picked their nearest mandrel to give an appropriate wall thickness. In theory they can tune the stiffness through the layup - I asked for it to have a bit of flex for comfort - nope, it is a very stiff bit of tubing (with the old 'bend it across the knee' trick). If I do this again I'll talk to them a bit more about quantifying the stiffness so it does what I want it to do. Why to do it? The initial idea had been to use the tuneability of the carbon to build in some passive suspension from the cantilevered seatmast. I guess now I could argue that it is to get a stiffer seatmast.... It saves 100g over an otherwise equivalent all-steel frame, and I really like the look. Otherwise no good reason really, it's fun to try new things though. I will be interested to see how it rides once it is all assembled. It is to be hoped he doesn't suddenly undergo a Growth Spurt. Anyway this morning I popped John on the back of our tandem and he and I rode the daily circuit and it was like having a motor on board. So I think I now know the answer to the question my wife sometimes asks when she's on the back, which question is 'Why are we going so slowly?' although I've yet to think of a tactful way of telling her what this answer might be. Right, s'nuff of that. Now we've got some Broadband I'll just nip over & see how Mr Knight's getting on with all the seasoned applewood he nicked off me. He usually blogs on a Wednesday.